Every year I plan to send out Christmas Cards. I am known for sending out January Cards. However, the past two years (or is it three), I haven't sent out any. Life just gets too busy in December and I cut it off my to do list. How embarassing, I am a Stampin' Up! demonstrator after all and help others make theirs! This year I have a plan--to make a few each month so I can send them out around Thanksgiving. To make sure I don't procrastinate, I joined a group on my favorite website Stampin' Addicts, that will force me to make at least 4 cards a month. True to my nature with these things, I forgot and had to make them January 31st to make the deadline! It took me about 3 hours to make 5 of these. Can you beleive it? I was so tired from my day job that Monday that I couldn't function at my normal pace. Hopefully, this month I don't procrastinate, so I am not rushed! Hold me to it! So cute! 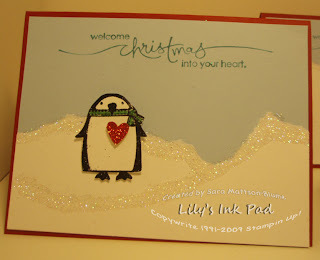 Love that penguin and his glittery heart! You guys!!! I can't do this, I swear! But I better go find this Christmas card support group. Cute, cute card! Awwwwww, isn't this the cutest little fella?!?! Just darling, Sara! 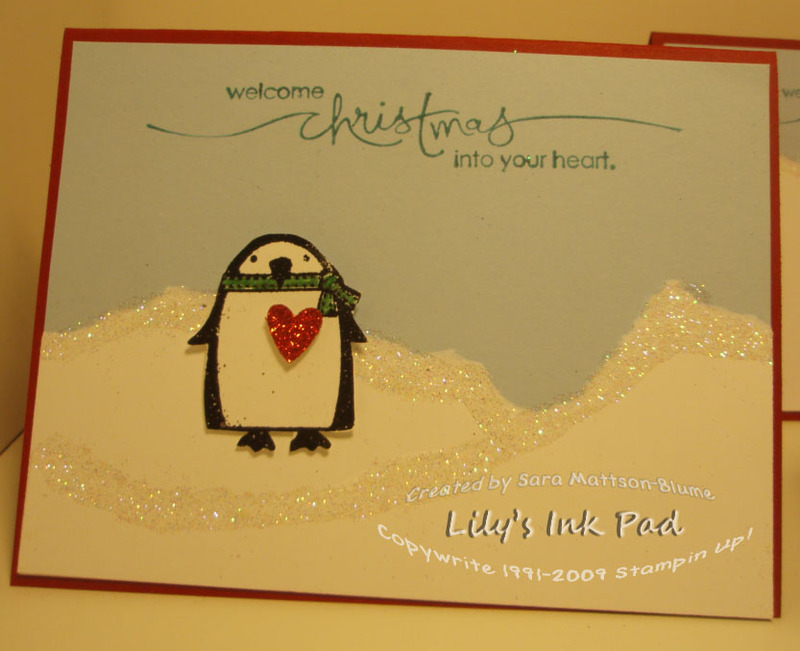 I love your little penguin! He's just too cute! Frosty the penguin! Oops wrong animal! He sure is cute though!! Very cute card! I completely missed my January goal. I'm hoping to catch up both January and February this month. Wish me luck! Very cute! Congrats on meeting your first month goal! What Could Do This to My Stamping Area? Valentine-palooza Day 3: "Owl Always Love you"
Shake Like You Mean It!